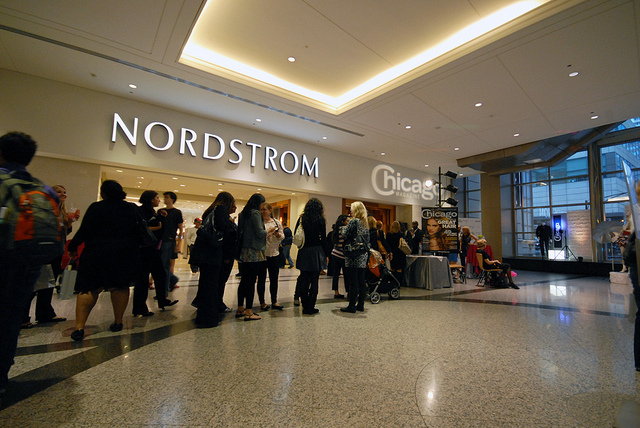 The Shops at Northbridge and Chicago magazine teamed up to sponsor some runway excitement for Fashion's Night Out. Here, patrons line up before the show. As you can see by the photo, the event attracted quite a few ladies. But found some stylish men as well. Photo by Caitlin Grogan. Fashion’s night out does not usually equal “dudes night out,” but we were not deterred when asked to spot some of the best dressed men at the Shops at Northbridge last night. Sure, we were extra motivated to find these men because we were paid to do so,* but if you think we’d salute the style of any ol’ schmo because cash is involved, then please recalibrate your expectations of this site. 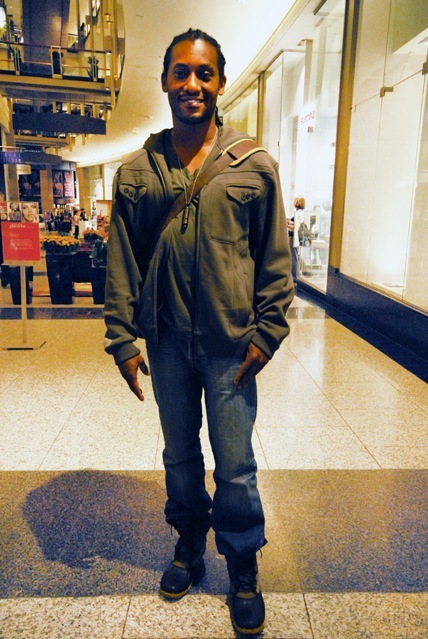 The following are photos* of fashionable men who were at Nordstrom and the Shops at Northbridge during Fashion’s Night Out (the event included a runway show sponsored by Chicago magazine & the awesome Chicago Blogger Network). What makes these men fashionable? Read below, but know this: we went out of our way to find men who weren’t slaves to fashion trends, and who didn’t wear street-style-blog calling cards. No offense to the truly fashion forward, but on this night, we were out to find guys who looked good but didn’t seem like they were trying too hard to get noticed. *Full disclosure: we are blogging Hessians, we are capitalists, and yes, getting some compensation for blogging is not something we’ll feel guilty about. Unless we’re paid in bushels of honey crisp apples. Those are delicious and always in short supply, and we’d feel bad about hoarding so many. *All photos by the amazing Caitlin Grogan. The pictures she took are great, so no offense taken if you just look at them and skip over the nonsense in word form. Shearling style works at any age. Guys, you could learn a thing or two from this young mans look. Photo by Caitlin Grogan. 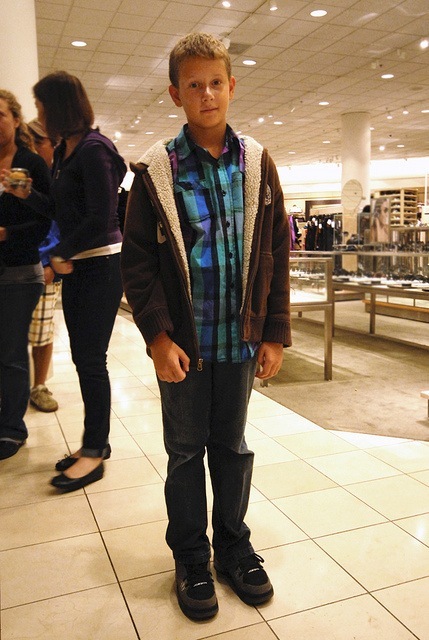 Who: A young man who just got a Flirty Girl Cupcake at Nordstroms. We won’t disclose his name and city of residence (if you’re not old enough to have a Facebook account, you’re not old enough to have your name plastered on Internet). He is wise and stylish beyond his years. His favorite basketball player: Derrick Rose, natch. Shearling might not make you look like this guy, but you'll still look good. Photo by Caitlin Grogan. 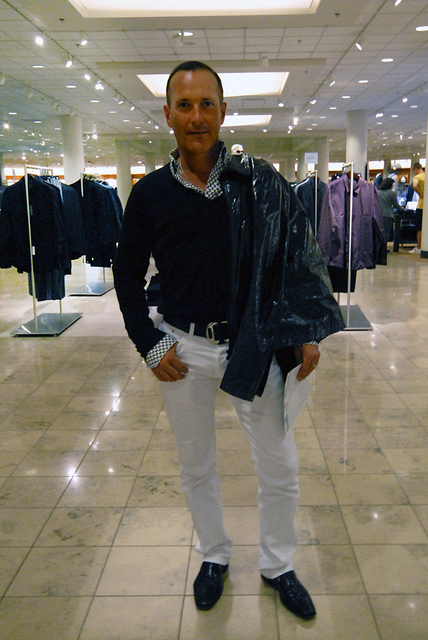 This model at the Shops at Northbridge Fashion’s Night Out event sports an aviator jacket with a shearling lining. So yes, the young man we photographed with the shearling-lined hoodie has some serious style chops. Lest you think we just included the young man to pander to an audience that thinks well dressed kids are adorable. We do not pander (but sometimes we lie about pandering). You too can wear white. Just follow Michael's example. Photo by Caitlin Grogan. Who: Michael Crowley, co-founder of the Michael & Michael Salon. Why we like his look: It’s not easy to wear white pants. Just ask Kim Kardashian. 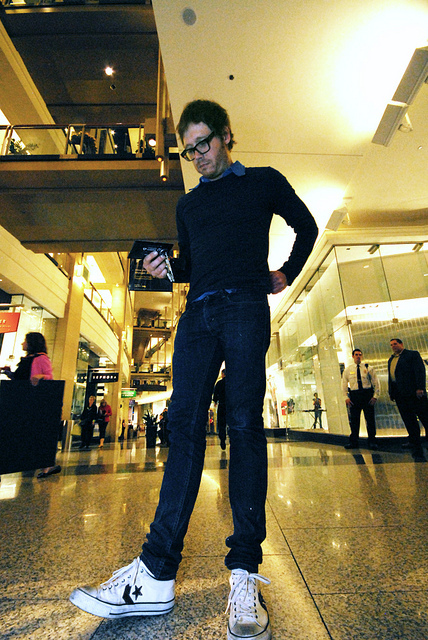 Michael pulls it off easily by keeping the pants slim, and combining the pants with a simple and fitted black v-neck. The pants will grab some attention, the rest of the outfit can be understated. 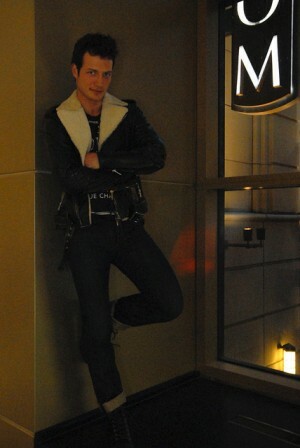 His favorite part of his wardrobe: His black leather jacket by Tim Hamilton. His drink of choice: Macallan 12 year on the rocks. His coffee of choice: Intelligentsia . Ahmad in a double-breasted trench. Photo by Caitlin Grogan. Why we like his look: If a person can look bad in a modern, double-breasted, three-quarter length trench coat, we haven’t seen it. Ahmad looks like he means business, and looks like someone with whom you’d trust to do business, even while standing in a terenchal downpour. 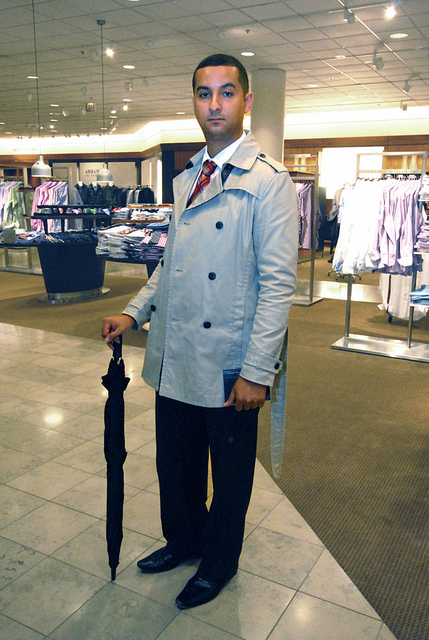 And you can trust a trim trench coat, like the one Ahmad’s wearing, to look good in all sorts of fall weather. 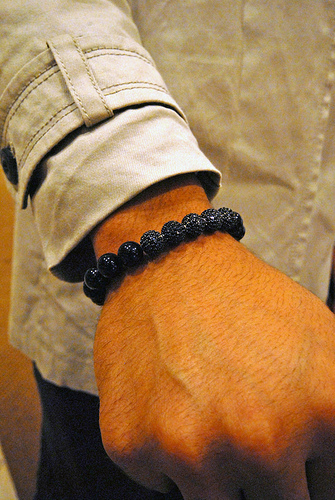 His favorite part of his wardrobe: A custom bracelet from Geneva Seal made from black diamonds and onyx (close up below). His favorite wardrobe additions in the past year: Lots of accessories, like the bracelet, and a Roger Dubuis timepiece. His Super Bowl Pick: Jets over Packers. Ahmad's boss bracelet. Photo by Caitlin Grogan. "I got way to many blues for any more bad news." But check out those shoes. Photo by Caitlin Grogan. Why we like his look: Monochromatic casual is not the best look during summer’s apex, but now that the weather is changing, this is a look men would be wise to copy. Jans’ button down is more a true blue, which keeps the darker blues from dominating the outfit. Monochromatic looks shouldn’t be all dark shades, all light tints, or all true hues. Mix it up. And if you have a pair of wicked kicks, like Jans’ John Varvatos edition Converse, that can’t hurt. Also, Jans mentioned he recently made the switch to slimmer fitting jeans. We think it was a wise choice, don’t you? His favorite part of the wardrobe: The shoes. Fashion item he’s not fond of: White belts. Coffee of choice: Folgers Instant Brew (it’s the best part of waking up, for real). Duck boots: Rubbery ruggedness. Photo by Caitlin Grogan. Why we like his look: What first got our attention is Eldon’s duck boots. They were appropriate for this night (it was raining), and the rubbery ruggedness paired nicely with the military green ensemble above the waist. We also dig a good hoodie, and Eldon’s deviates from the mean by having breast pockets with button flaps. Good details rarely fail. His favorite part of the wardrobe: His “Falling Whistles” necklace. The necklace helps raise awareness and money for war-affected children of the Congo. It’s a great looking necklace too. Note to charities selling fashion pieces (we’re looking at you Lance Armstrong): When you make accessories to raise awareness and money for good causes, it helps to make the accessories look good. Read more about Falling Whistles on its website. Fashion item he’s not fond of: Muscle shirts. Super Bowl pick: Bears over Patriots.